Security checks constitute the basic server-side building block of the MobileFirst security framework. A security check is a server-side entity that implements a specific authorization logic, such as obtaining and validating client credentials. You protect a resource by assigning it a scope that maps to zero or more security checks. The security framework ensures that only a client that passes all of the security checks of the protecting scope is granted access to the resource. 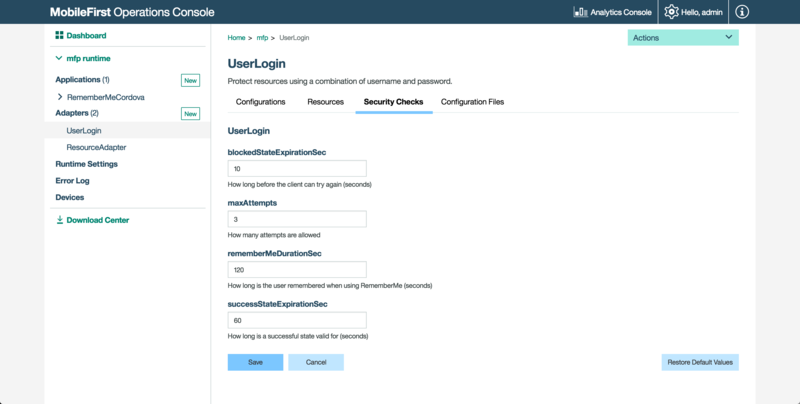 You can use security checks to authorize access both to resources that are hosted on MobileFirst Server and to resources on an external resource server. An adapter can either be a resource adapter (meaning it serves resources and content to send to the client), a SecurityCheck adapter, or both. Note: While security checks are implemented within adapters, the MobileFirst security-framework and adapter APIs are separate and cannot be mixed. Therefore, you cannot use an adapter API, such as the AdpatersAPI interface, in your security-check code, and you cannot use security-check APIs in adapter resource code. The architecture of the security framework is modular and flexible and so the implementation of the security check is not inherently dependent of any specific resource or application. You can reuse the same security check to protect different resources, and use different security-check combinations for various authorization flows. 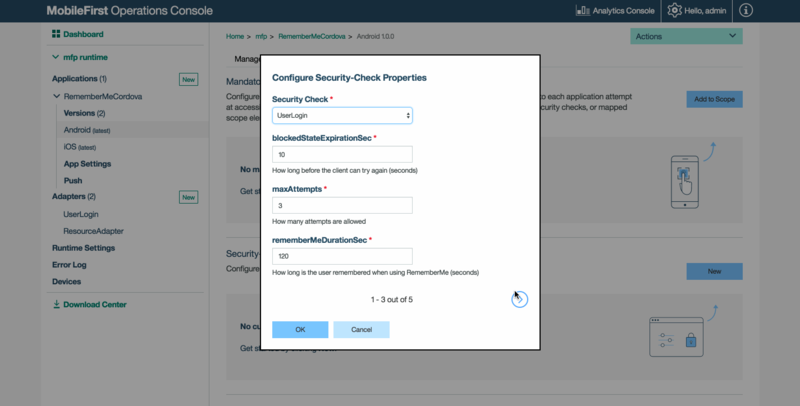 For enhanced flexibility, a security-check class exposes configuration properties that can be customized at the adapter level both in the security-check definition and during run time from the MobileFirst Operations Console. To facilitate and accelerate your development process, Mobile Foundation provides base abstract implementations of the SecurityCheck interface. In addition, a base abstract implementation of the SecurityCheckConfiguration interface is provided (SecurityCheckConfigurationBase), as well as complementary sample security-check configuration classes for each of the provided base security-check classes. Start out with the base security-check implementation (and related sample configuration) that best fits your development needs, and extend and modify the implementation as needed. Learn more about the security check contract. Read the Authorization concepts tutorial. Learn how to create adapters. The security check base classes that are described below are available are part of the MobileFirst com.ibm.mfp.security.checks.base Java Maven library, which are downloaded while building the adapter from from the Maven Central repository. If you are developing offline, you can download these from the MobileFirst Operations Console → Download Center → Tools tab → Security Checks. When creating a Java adapter, the default template assumes that the adapter will serve resources. It is the developer’s choice to bundle security checks and resources in the same adapter, or to separate them into distinct adapters. To remove the default resource implementation, delete the files [AdapterName]Application.java and [AdapterName]Resource.java. Remove the <JAXRSApplicationClass> element from adapter.xml, too. The name attribute is the name of your security check. The class attribute specifies the implementation Java class of the security check. You need to create this class. Security checks can be further configured with a list of property elements. For defining custom properties, see Configuring security checks. In the Configuration Files tab you can see the server copy of your adapter descriptor, including the <securityCheckDefinition> element that defines your custom security check and its configurable properties. You can also pull the adapter configuration and push it to different servers. In the Security Checks tab you can see a list of all the configuration properties that you exposed in the security-check definition. The properties are referenced by the value of their configured displayName attribute, or by the value of the name attribute when no display name is configured. If you set the property’s description attribute in the definition, this description is also displayed. For each property, the value that is configured in the defaultValue attribute is shown as the current value. You can change the value to override the default value from your security-check definition. You can also restore, at any time, the original default values from your security-check definition. You can also select an application version from the Applications section of the MobileFirst Operations Console. Create the Java class for the security check. The implementation should extend one of the provided base classes, as shown below. The parent class you choose determines the balance between customization and simplicity. SecurityCheck is a Java interface, which defines the minimum required methods to represent the security check. It is the sole responsibility of the developer who implements the security check to handle each scenario. This abstract class implements a basic version of the security-check interface. It provides, among other options: externalization as JSON, inactivity timeout, expiration countdown, and more. Subclassing this class leaves a lot of flexibility in your security check implementation. Learn more in the ExternalizableSecurityCheck tutorial. This class extends the ExternalizableSecurityCheck and implements most of its methods to simplify usage. Two methods must be implemented: validateCredentials and createChallenge. The implementation allows a limited number of login attempts during a certain interval, after which the security check is blocked for a configured period. In the case of a successful login, the state of the security check remains successful for a configured period, during which the user can access the requested resource. The CredentialsValidationSecurityCheck class is meant for simple flows to validate arbitrary credentials, to grant access to a resource. A built-in capability to block access after a set number of attempts is also provided. Learn more in the CredentialsValidationSecurityCheck tutorials. This class extends the CredentialsValidationSecurityCheck and therefore inherits all of its features. The class adds to it an implementation that creates an AuthenticatedUser user identity object that can be used to identify the current logged-in user. A built-in capability to optionally enable a “Remember Me” login behavior is also provided. Three methods must be implemented: createUser, validateCredentials, and createChallenge. Learn more in the UserAuthentication security check tutorials. Each security-check implementation class can use a SecurityCheckConfiguration class that defines properties available for that security check. Each base SecurityCheck class comes with a matching SecurityCheckConfiguration class. You can create your own implementation that extends one of the base SecurityCheckConfiguration classes and use it for your custom security check. For example, the createConfiguration method of UserAuthenticationSecurityCheck returns an instance of UserAuthenticationSecurityCheckConfig. UserAuthenticationSecurityCheckConfig enables a property called rememberMeDurationSec with a default of 0. In the Java adapter’s adapter.xml file, inside <securityCheckDefinition>, you can add one or more <property> elements. displayName: optional, a user-friendly name to be displayed in the console. type: optional, ensures that the property is of a specific type such as integer, string, boolean, or a list of valid values (for example type="['1','2','3']"). For a real-world example, see the Configuring the Security Check section of the CredentialsValidation security check tutorial. In the MobileFirst Operations Console → [your adapter] → Security Check tab, you can change the value of any property defined in the adapter.xml file. Note that only the properties defined in the adapter.xml file appear on this screen; properties defined in the configuration class won’t appear here automatically. You can also manually edit the adapter’s configuration JSON file with the required configuration and push the changes back to a MobileFirst Server. From a command-line window, navigate to the project’s root folder and run the mfpdev adapter pull. Open the configuration file, located in the project-folder\mobilefirst folder. Deploy the updated configuration JSON file by running the command: mfpdev adapter push. Property values can also be overridden at the application level. In the MobileFirst Operations Console → [your application] → Security tab, under the Security Check Configurations section, you can modify the values defined in each security check available. Continue reading about security checks in the following tutorials. Remember to deploy your adapter when you’re done developing or making changes. Learn about additional Mobile Foundation authentication and security features.